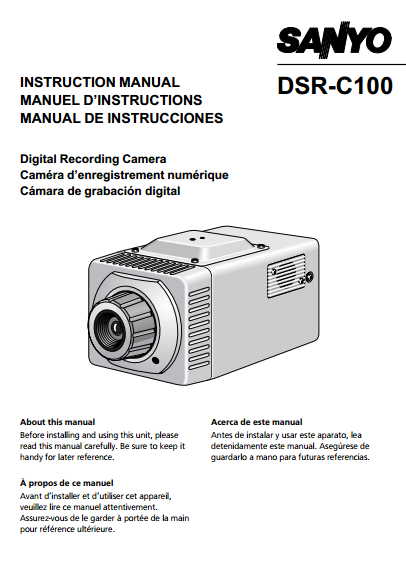 The Sanyo DSR-C100 Camcoder Manual is available in english and spanish language. This Digital Recording Camera equipped with a 3.5-inch hard disk. So, The images are recorded directly to the camera’s hard disk. The saved images can then be manipulated using a CompactFlash card and a personal computer. There are four recording modes are available such as Pre-alarm recording, Post-alarm recording, Backup recording and Suspicion recording. The Sanyo DSR-C100 Camcoder User Manual is consisting of 45 pages with file size of 1.06 MB. It's devided into 23 section. This manual contains reference information such as features and accessories, part names and functions, Installing the Ni-Cd battery, Connection to a computer, Hard disk recording areas, Protecting the hard disk, Setting to standby mode, Menu screen display, Changing the alarm capacity, Hard disk initialization. Then about Setting a camera ID, Setting a password for initializing the hard disk, Pre-alarm recording flow, functions operation like Function operations for ALARM recording images, Function operations for SUSPICION recording images, Function operations for ARCHIVE recording images, Function operations for EXTENSION recording images, Image enlargement (ZOOM), Setting date/time/information, Formatting the memory card, replacing the hard disk drive, and more.